We also offers Stickers - Screen Printed on Vinyl & Polycarbonate in different colours as per specifications of our clients. 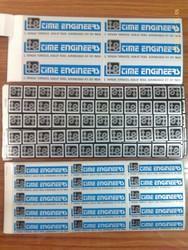 These Vinyl Polycarbonates Stickers are manufactured required for machineries, Control Panels, Packing etc. We supply in any quantities. Pricing depends on Size and No of colors. 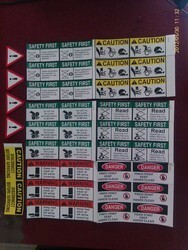 We manufacture Safety Stickers On Vinyl required for any kind of industry for their Machinery, Instruments as per customers specification at reasonable rates for bulk as well as small quantities. 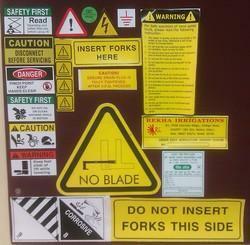 We offer top grade stickers - vinyl & polycarbonate of all types, which are known for their excellent life and adhesive. Our vinyl & polycarbonates stickers are weather resistant and no. 1 in quality. These are multi-coloured as per customer's specifications. Polycarbonate stickers can be printed from back side also.